Double Dewlap! What Does It Mean? My new book A Field Guide to Mesozoic Birds and Other Winged Dinosaurs is now available! The book can be purchased via Amazon or CreateSpace. A PDF version is available via Lulu (for those of you reading this via RSS, click through to the Web article for handy links on the right side of the post!). A lot has been made recently about the "new era" dawning in paleoart (or paleontography, or whatever your preferred term is). 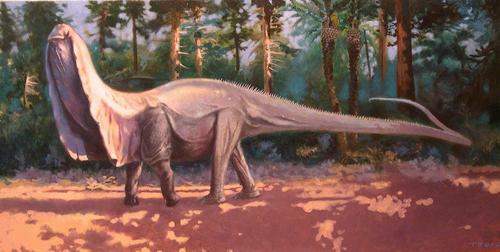 A move away from the shrink-wrapped and hyper-anatomical artwork that characterized much of the Dinosaur Renaissance. While attention to this new movement has focused mainly on the artwork in the fantastic new book All Yesterdays, Andrea Cau rightfully pointed out on his blog that other artwork has been appearing in this same vein for a while now (though perhaps lacking the publicity it deserves). Cau highlighted the amazing paleo paintings of artist Emiliano Troco, including the rather audacious reconstruction of an Apatosaurus with double dewlap-like structures on the neck. I guess it's an argument for either the collective consciousness, or that there are in fact a limited number of outlandish yet plausible things you can do when restoring sauropod necks, that I came up with a very similar idea many years ago! 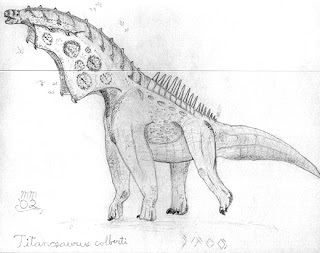 My execution of the double dewlap sauropod was somewhat... lacking in technical skill compared to Troco's, but you have to admit it is kind of funny that two people independently came up with such a bizarre idea. After a bit of searching I managed to find a really bad scan of my old sketch, presented below or your amusement! My 2002 drawing of an Isisaurus (Titanosaurus colberti at the time) with double dewlaps. Based on a skeletal by Jaime Headden.